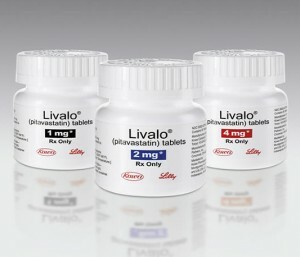 Livalo, also known as pitavastatin, is a prescription medication for adult patients with high cholesterol. Although it slows the body’s production of cholesterol, Livalo comes with several irritating side effects, including constipation and diarrhea. The most common side effects often go away as the body acclimates to the medication. Discuss your medical history, current medications and alcohol consumption habits with your doctor before taking Livalo to avoid rare, but serious, side effects. Consult your doctor if these symptoms become severe or do not go away after several weeks. He or she will adjust your dosage, if necessary, and discuss ways to minimize uncomfortable or persistent side effects of Livalo. There are a number of other side effects that, although not related to an allergic reaction, are serious enough to warrant an immediate call to your doctor. Consult your doctor if you experience any of the uncommon, but serious, side effects associated with Livalo and pitavastatin. Depending on the symptoms and their severity, your doctor may adjust your dosage or advise you to discontinue Livalo treatment. Because there is a potential risk of liver damage, doctors will often perform blood tests to determine liver function before prescribing Livalo or pitavastatin. Subsequent blood tests will be performed 12 weeks after the start of treatment, after any increase in dosage and every six months during the duration of the treatment to monitor liver function. Your doctor will advise you of any change in liver function and may adjust your dosage. It is important to keep your appointments for blood work to avoid potentially serious side effects. Before prescribing Livalo or pitavastatin, your doctor will consider your particular medical needs and weigh the benefits of the drug against the potential Livalo side effects. Most patients who take Livalo to lower their cholesterol experience only minor side effects that fade with continued treatment. Although there is a potential for several very serious Livalo side effects, these side effects are uncommon.